Classroom Freebies Too: FREE Math Problem Solving Tips eBook! FREE Math Problem Solving Tips eBook! I know problem solving in math (especially with the standardized testing season upon us) is a skill that continually needs honed. Here are some great ideas! With trick questions, answers that are super close to one another, and vocabulary that looks like a foreign language, many students really struggle with story problems in math. And that is just for those students that are good readers – we won’t even begin to mention the struggling readers! 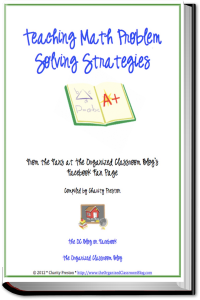 Want your free copy of the Teaching Math Problem Solving Strategies eBook?